Following hidden codes embedded into live stream videos, commanders found out about the currently ongoing hunt. Is it actually alien related or something completely different? We knew something was going to happen on the 28th in Pleiades IH-V c2-5 so a huge mass of commanders flew down to satisfy their curiosity. As mentioned by Frontier – this is just the first phase of a bigger event and this stage took place in Open mode only. What we knew from the previous messages were the names of commanders that were supposed to appear in Cail at 10:00 (Logan Kohl), Apademak at 15:00 (Mahina Dillon last seen in Pic Tok) and finally Apademak again at 21:00 (Otto Granger). Literally thousands of commanders swarmed the systems in hope it will be their ship to contact the mysterious commander first. The interesting fact about these 3 is that one of them is a liar (apparently Dillon) and that just makes the next step of the puzzle a bit harder. So… what did we learn from the new contacts? Logan Kohl: "One of my friends always lies. The system has a single M-class star." He also offered a second clue in exchange for narcotics. Mahina Dillon (lie): "I visited a rocky planet at latitude 34 near binary pulsars." He also offered a second clue in exchange for tobacco. Otto Granger: "I visited a system with 10 bodies and one sun. After the incident I woke up in a system far away." He asked to bring him Lavian Brandy in Scott Orbital, to give us some other clues. 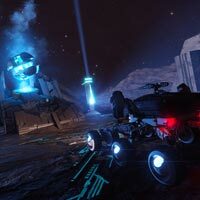 Even though, the whole thing is very fun and has been engaging the community even outside of the game – it really looks like this has nothing to do with Thargoids. Just think about it… If a bunch of commanders actually found a solid proof of alien life – why would they go around playing these scavenger hunts with us instead of publishing it to public immediately? Kohl even said that what he has to share is “cool”. Lore-wise, it makes little sense for any member of the Elite universe to play mind-games and have people running through hoops to reveal something as big as proof of alien life. The next step of this puzzle is the upcoming community goal which requires bringing drugs, tobacco and booze to these 3 commanders, which again, hint that they’re pretty much throwing a party of some sort. So – before you all go nuts about the big Thargoid reveal, just think about it for a second… And you just might realize Frontier might have something else prepared for us. Maybe even something not announced at Gamescom… for a reason.